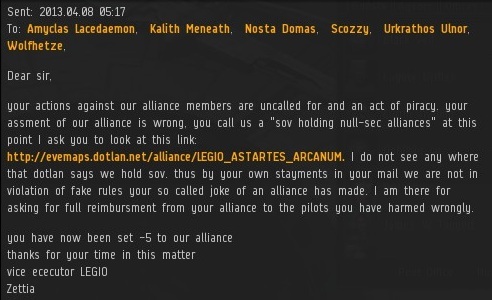 So wait a second...these null-sec alliance people came to high-sec to mine and now are complaining about getting ganked, but they themselves are gankers? Hyprocrisy does that to me though. 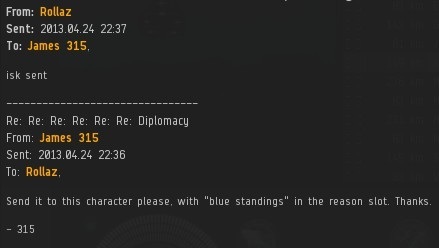 Its a shame the entry didn't include any of agent Amyclas' righteous smack down and Zero tolerance of nullsec carebareism. It was glorious to read and should be available as instruction material for all agents of the order. I'd be very interested to read... perhaps you could post it as a comment? I'm just a trigger puller for the NO. Since it was sent to the corp I don't think it is up to me to publish it. Maybe Amyclas will see this thread and agree to publish it. 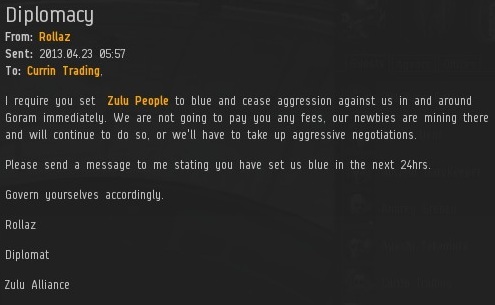 I knew Rollaz was lying to me and other agents when he told me he had an agreement with James 315. 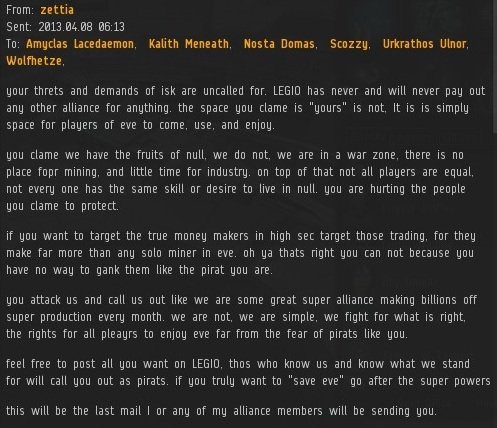 He was claiming that he had bought mining permits for his whole alliance without needing to pledge loyalty. As i am a agent of honour and trust i quickly doublechecked every information source aviable. I checked this blog, i checked our permit holder list... and nothing. Then i asked for proof and he sent me the mails that went between him and James and there it was. The big lie of rollaz, now also revealed on this internet page. All he bought was blue standing with James 315. On no occasion James 315 said anything how he treats blues nor that he will not continue shooting them. So all confused miners out there let me clear some misunderstandings up. 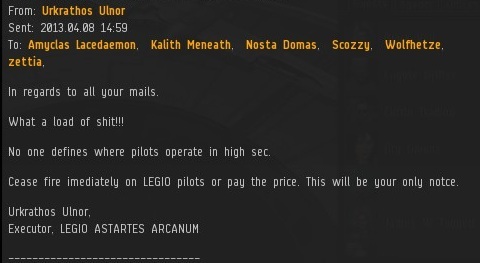 First of all we are "The New Order of Highsec" and not "The new World Order" as some people claim. 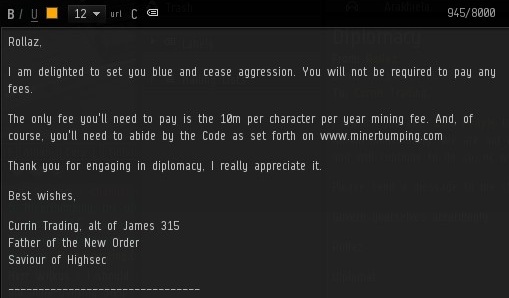 Second, we are not selling standings, we are selling mining permits and everyone needs to have his own for 10 mill a pop. Then you MUST pledge loyalty to James and the new order in your bio. When all steps are completed you get a place on our permit holder list and with no other circumstances! Except to follow the code. There isn't one step that's the most important they are ALL important and must be followed. Failure to complete any steps may result in justice being delivered. In regards to the Bio change it's not mandatory it's strongly encouraged. I see this one running longer than strawberry. Perhaps they only bought light blue standing and should really pay another 250 mill for dark blue standing - you know the super secret standing only available to premium members? With 24/7 live teamspeak support. James you can't just leave this one to wither and die, a precious gem like this needs cultivation... Maybe a wardec? You'd think those long winded nullbears would be better spellers. English may not be his first language. But then again, they don't teach kids how to spell these days. Or do math. Or apparently anything else until they get shoved into remedial college courses. "The Code is so much more than the carebears deserve."